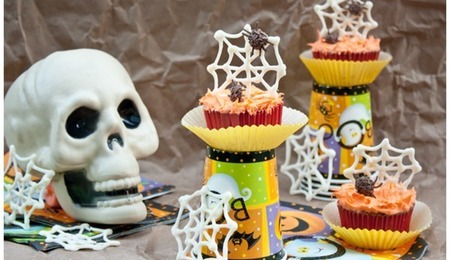 Theres something about Halloween treats that are extra fun. Maybe its the fact that normally scary and ugly things can be turned super cute. Maybe its the fact that the whole holiday centers around sugar and sweets. Whatever it is, I hope these spider cake pops make it on to your list of Halloween treats to make this season! Start by making your cake balls and chilling them in the fridge until you are ready to start dipping yor spider cake pops. 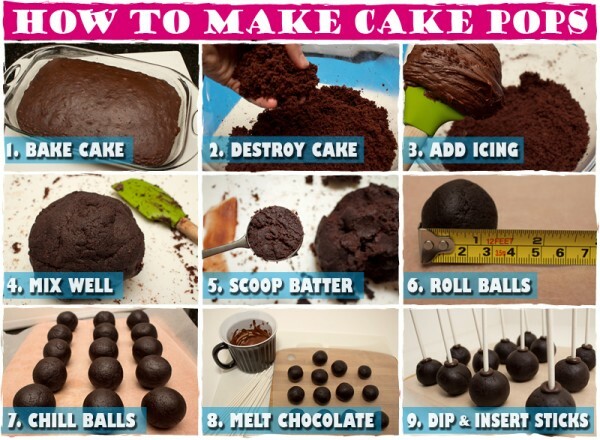 If youve never made cake pops before and would like a an action-packed tutorial before you get started, theres no better source than the cake pop queen herself, Bakerella. 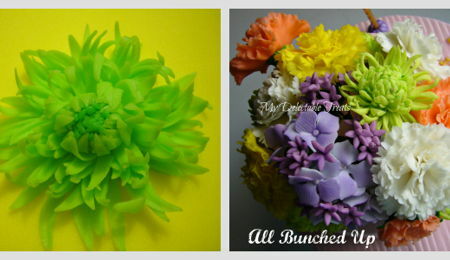 Her website has lots of tutorials and cake pop inspiration. While your cake pops are chillin like villains, you can make your candy spiders. 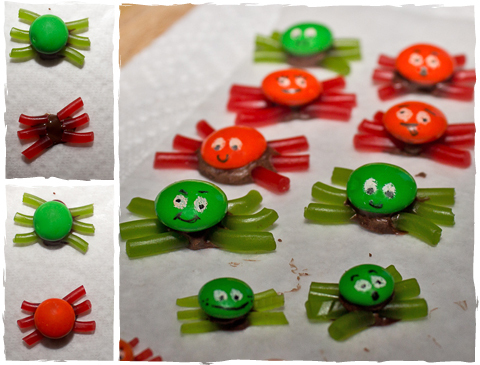 No Halloween treat is complete without candy spiders! (If you want to skip this step, feel free to assemble your candy spiders directly on your dipped cake pops. Personally, I like to do as much as I can ahead of time to avoid the pressure of having to quickly decorate the pops before the chocolate hardens (a.k.a. cake pop panic). : 1. Separate out the orange and green M&Ms (and minis) that you want to use and slice your shoe string candy up into pieces for the spider legs. 2. Melt a small amount of your dark-colored chocolate in a sandwich bag. Cut a little tip off of the bag so that you can pipe the chocolate. 3. Pipe a blob (thats a technical term used by only the most professional cake pop decorators) of chocolate slightly smaller than the size of the M&Ms onto a sheet of wax paper. Before the chocolate dries set three spider legs on the right side of the chocolate blob and three on the left. Then, set an M&M in the center, applying a little pressure if needed to make sure that the M&M is secure the chocolate. Repeat this process for each candy spider you want to create and set them aside until all the chocolate has hardened. 4. Using a small paint brush and white gel food coloring, draw small circles on the M&Ms for the spiders eyes. Add facial expressions using a black food coloring marker. This is the part where you give each of your candy spiders a personality, bonding with certain ones while reassuring the others that you love them all equally and have no favorites or not. 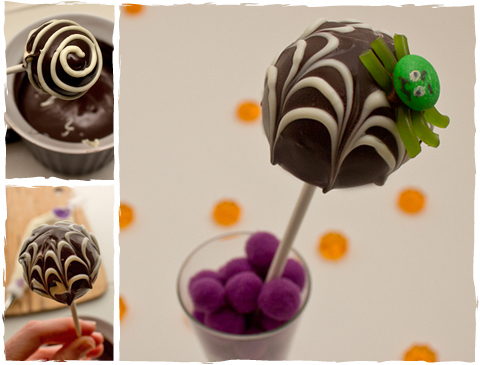 Once youve finished creating your candy spiders youre ready to move onto the cake pop portion of your Halloween treats. 1. Take your cake pops out of the fridge while you prep the chocolate. Melt your dark-colored chocolate in a container that will be easy for dipping. Also, melt your white chocolate in either a Ziploc bag with a tip cut off or a piping bag (make sure the metal tip is not on the bag when you put it in the microwave). The marbling technique that you will use to make the spiderwebs is the same process that I showed you on the royal icing for my butterfly cookies. Since it is a wet-on-wet technique, it is important that your cake pops are not too cold, causing the chocolate to harden before you can finish marbling. You may need to reheat your chocolate during this process to keep it warm. 2. Dip your cake pop into the dark-colored chocolate, gently tapping off any excess chocolate. 3. Turn the cake pop upright and pipe a swirl pattern using your white chocolate. 4. Immediately drag a toothpick in a vertical line from top to bottom on the cake pop. Repeat this on multiple spots in the icing to create a web effect with the white icing. Make sure to work only on the surface of the chocolate. Do not apply pressure to the toothpick, pushing into the center of the cake pop. 5. 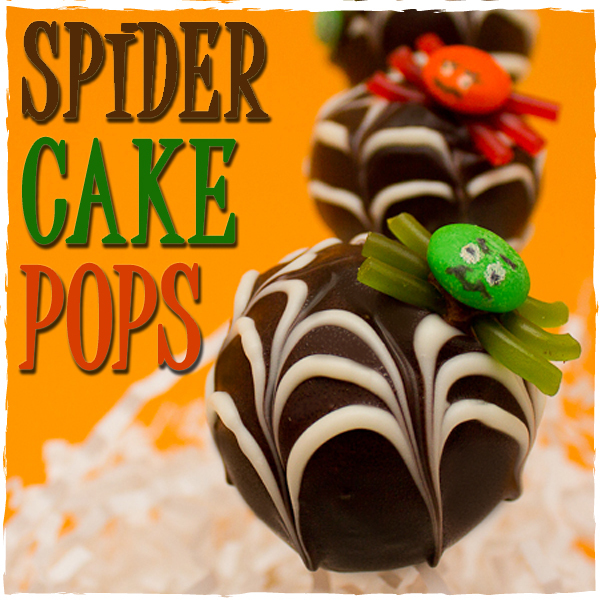 After your web is complete, while the chocolate is still wet, add a spider or two to the cake pop. 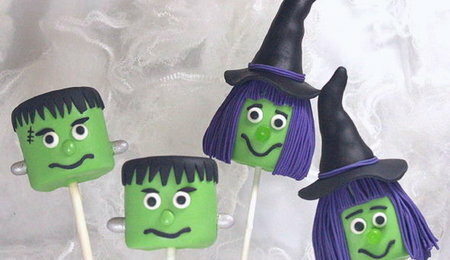 The individual facial expressions on the candy spiders is what really kicks up the cuteness level on these spider cake pops so have fun with it! Sit down for a Law & Order marathon with your M&Ms and food coloring markers, get into the Halloween treat-making spirit, and let your imagination run wild!